Opus 4 String Quartet’s broad repertoire, which includes classical chamber music, tango, modern pop, and some surprises, is intended to convey, above all, the joy of music. 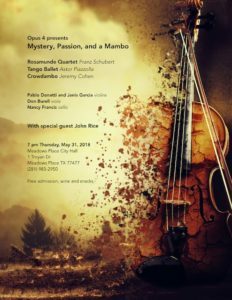 Come and enjoy the sounds of Mystery, Passion and a Mambo! 5/31, City Hall; 7:00pm, No Fee , Wine and snacks will be served.